The Escher Sofa Table is based on the classic artwork of M.C. Escher. 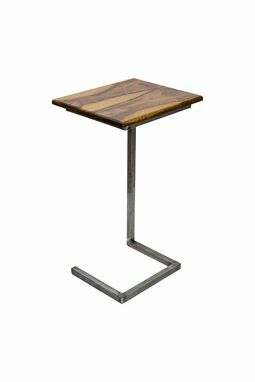 This table features an "Escher Inspired" raw steel welded base with felt pads on the feet to protect the floor it stands on, and a solid hardwood top. The Escher Table is perfect for any living room couch or chair. It easily slides under the legs to create a table space where traditional tables can't fit. We offer our Escher table in a variety of sizes and wood types. Order yours today. These table tops are finished with an all natural, plant based, oil finish. The finish used is called WOCA oil and is VOC-Free and eco friendly. As with all oil finished, if not properly maintained ring stains and natural discoloration can occur. 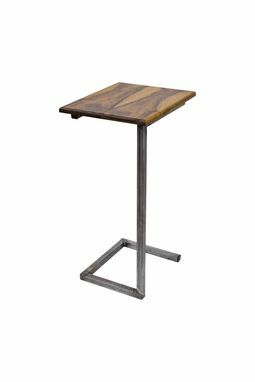 Our Escher table is available in several different kinds of hardwood tops such as Walnut, Maple, Cherry, Oak and Imbuia. This listing is for a custom made to order table. Each table is made to order one at a time. Please allow 2-4 weeks for completion and shipment. Contact us for more information or custom sizing options. ***Additional shipping charges may apply for any multiple orders or large sizes. Awesome job. Highly professional. Great communication. The workmanship was extremely high quality as well. Five stars.